Home AP State Guidelines JOBS Latest SSA Teachers related SSA AP IERT(Inclusive Education Resource Teacher) Posts Recruitment 2017 Notification. SSA AP IERT(Inclusive Education Resource Teacher) Posts Recruitment 2017 Notification. SSA AP IERT Posts Recruitment 2017. Sarva Shiksha Abhiyan(SSA), Andhra Pradesh IERT Posts Recruitment 2017. SSA AP Recruitments. 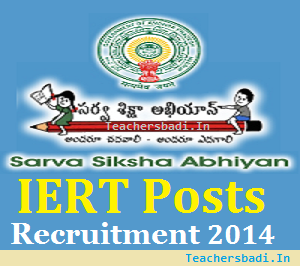 AP SSA IERT Posts Recruitment: Sarva Shiksha Abhiyan(SSA), Andhra Pradesh has given notification for the recruitment of Inclusive Education Resource Teacher vacancies for the academic year 2014-2015 on contract basis. AP SSA is inviting applications from the candidates who have passed their Degree or Diploma in Special Education or equivalent course as prescribed by the Rehabilitation Council of India to work as Inclusive Education Resource Teacher to teach to the CWSN, temporarily on contract basis for a limited period. The process of engagement of IERTs in the vacant posts is for academic year of 2014-15 only and it is purely temporary and on contract basis. Should anybody be found neglecting his/ her duties, he/she can be terminated without notice. The candidates, if selected, should have to work in the mandals and they have to enter into contract with the APSSA before they are given placement orders. The Candidates must have Degree or Diploma in Special Education or M.Ed. B.Ed./D.Ed. in Special Education. Qualification prescribed by the RC/, New Delhi to work as Resource Teachers should be followed. Based on performance in Written Test and Interview and the selection process will be done by the District Project Office only. The rule of reservation and presidential order will be followed while filling the IERT vacancies in the district. Selection will be done on the basis of marks obtained in the written test (100 marks). Merit-list will be prepared basing on the written test marks secured by the candidate. The duration of written test will be for 2 hours i.e from 10:30 to 12:30 noon. Application Form: The candidates may download the application form and instructions to the candidates from the official website of AP SSA. Candidates should submit the completely filled in application only in the format prescribed by the AP SSA on or before 03-09-2014 in their respective District Project Office of SSA during office timings and obtain acknowledgement slip. Applications will be received till 5 pm of 3rd September, 2014 and after 5 pm applications will not be accepted. Marks memorandum of SSC (proof for date of birth). Marks memorandum of Board of Intermediate Education. Study certificate from the college in which the professional Degree or Diploma completed. Nativity Certificate/ Study Certificate 4th to 10th class. Candidates shall affix her/ his recent photo and shall sign on the photo. Disability certificate issued by the District Medical Board (if they claim reservation under PH category or parent of CwSN) and such other documents as required by the candidate. At the time of counselling, the candidate shall bring all the relevant original certificates as mentioned above along with nativity certificate for verification purpose. 2. Last date for submission of Application: 03/09/2014. 3. Date of written examination: 14-09-2014.